I always tell everyone I can’t bake. The truth is I nearly burned my house to oblivion in a cooking accident, but thus far I have only just managed to burn bakery items. In all honesty, I can bake, I can cook, but I have a horrible time concentrating on the end result. Translation: I walk out of the kitchen way too much. I go to the Internet, I go to the TV, I talk with my family, I just get distracted in general. I can cook up a recipe to a “T”, I can create, I can alter, but after something goes in the oven, my brain goes numb. It’s like I need an assistant. So last night when I went to bake a pound cake, I was bound and determined NOT to ruin it via burned toppings and sides. For the record, I almost always set my timer…I just don’t always hear it….unless it’s a fire alarm- which isn’t good usage of letting you know something is “done”. However if you have no issues taking your baking items OUT of the oven, here is a lovely recipe I managed to make from beginning to end last night and still leave the kitchen standing. Pound cake is obviously one of those things that can be made a million ways. You can really up the sugar in it, change out some ingredients to include cream cheese as a base, or add all sorts of extracts for flavors you love, but overall its a very rich, thick-tasting “cake” that is best served as an addition to something else (at least in my taste buds view). Before you start the steps, this is for a PLAIN buttery pound cake. Some people like to bake in nuts, chocolate (cocoa), lemon or orange juice, berries, chocolate pieces, jelly beans, whatever. By all means, be creative. I wouldn’t mind dropping a Snickers Bar inside the middle of this batter to see what happened one day myself. But if you plan on doing something extra, might want to have those ingredients handy. Step #1: Your eggs and butter need to be room temperature. Don’t try to cheat around this process or it throws off your recipe mojo. Put your eggs in some hot water if you don’t take them out in time (read: not boiling water…) and leave your butter out for at least 30 minutes or so. Preheat oven 325 and Grease a 10″ bundt pan or 9 inch loaf pan with butter or shortening very liberally and dust with flour. Resist all temptations to put your finger in the butter. Step #2: Mix all ingredients…..about medium to medium high for 3-4 minutes. Its very helpful if you have one of those Kitchen Aid Mixers, but for us amateurs, persistence will have to do. I was tapping my fingers by like minute 4…but as the butter and sugar get more and more mixed, it becomes lighter and fluffier. I only taste-tested the sugar-butter out like 4 times. It’s so good like this. I think a good recipe for a perfect waffle topping too! Step #3: I like a little crunchy top, so I put a few tablespoons of granulated sugar on the top of the batter so when it comes out it has that nice film of sugar baked on the surface. Yum. Step #4: Pour the batter into the greased and floured pan and bake for 65-75 minutes until a toothpick entered into the center comes out clean. Now that it’s out, presumably it’s not burned, and you have some choices after it cools down.You can glaze it , frost it, throw it in a bowl and douse with strawberries and whipped cream, or just slice off a piece and enjoy all 5000 calories of this dessert. Step #5: Glaze it: When the cake is done you can make the glaze by combining all ingredients above into a small saucepan over medium-low heat. Stir continuously until the butter is melted and the sugar is dissolved. Do not bring to a boil. Poke holes all over the warm cake using a knife and pour the glaze evenly on the cake while still in the pan. Allow the cake to cool completely in the pan and then invert the cake onto a serving plate. Disclaimer: I am not responsible for your weight gain. 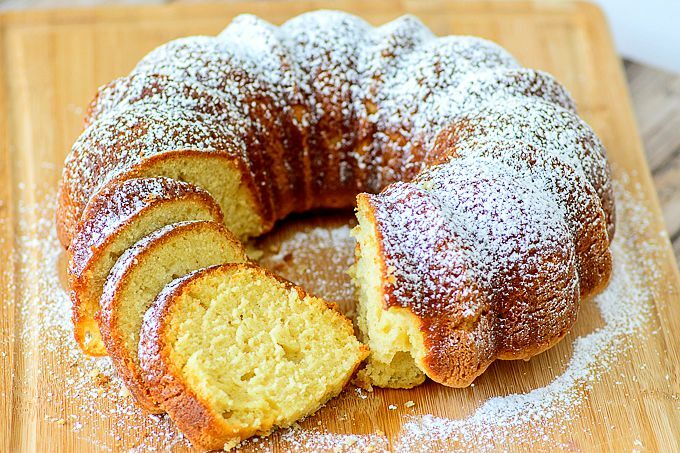 Any experience with pound cake? Leave me your recipes below! 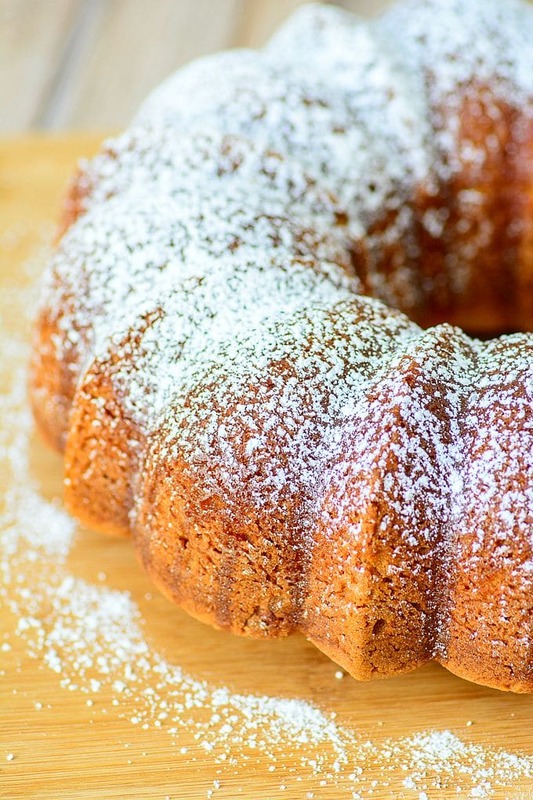 Plus, do not have a perfect Bundt cake pan? Try this one! This recipe was both delicious and entertaining. I’m a fan. I love how you wrote out this recipe. I made a variation of this recipe. I added 4 oz of sour cream, 8 oz of Cream Cheese. 1 1/2 cups of butter, 1 tbsp of vanilla & 1 tsp of almond. 3 cups of sugar & 3 cups of swan cake flour. I got 3 loaves out of this recipe. I can bake, i’ve just never been a fan of pound cake as it can come out very dry sometimes. Now I’m looking for a topping…something other than the standard whip cream & strawberries. I’ll probably just glaze it though……even though I don’t usually glaze either. Thanks for this recipe…..I liked that you just cut to the chase & made it out for everyday women to make. We aren’t all chefs….so it’s nice to have a recipe that is easy and will work. My husband flipped out…loved it. My name is Annette and I just made the pound cake and my family loved it. What size cake pan is used for this recipe? Thank you. Is this butter salted or unsalted? I just made this cake and it is amazing! I am a horrible baker and a good cook, so myself (and my fiance) was thriled at how well it turned out! I tried your butter cake recipe and might i add i am a very good cook all around…this recipe is so missing something…..i use swan cake flour which makes cakes light…..don’t know what i did but this receipe was not good at all….i wasted my butter my vanilla my flour not to mention my eggs and time……..
Obviously not every recipe is for every person, but this recipe was originally printed in Martha Stewart Magazine, so it isnt “mine”. I just simply shared our cooking it. I am sorry it wasnt one that you enjoyed. Perhaps you can leave them some feedback on their magazine page. I don’t mean to be harsh…but maybe something was left out….as one of the comments from one of the women mentioned about the salt not being mentioned……but i will continue to try the recipes i do LOVE to cook….i do follow recipes to the letter..
You wrote a pinch of salt as an ingredient in the recipe, but it is not mentioned anywhere else in the recipe. Was that a mistake? Does it need to be added? I have a can of Reddi Whip in the fridge screaming to be used. Now I know what I’ll use it for! I love pound cake but am horrible at making it! Maybe I should try again! Oh man that looks so good. I’m so happy the house is still standing! Impressed! I love adding almond extract instead of vanilla. I might have to try your version this weekend. ooh yeah that sounds excellent!! I love almond extract. I made your cake last night but 2 minutes into the mixing my mixer broke…..so I will not tell you mine looked anything like yours and I’m sure it didn’t taste so great either. Dang Trisha, I’m pleasantly surprised … that looks really good! I’ve never made a pound cake myself, the frozen Sara Lee ones are just too good for me to bother. But seeing yours, I wonder if I’m missing out. I’m a simple kinda pound cake eater and cut it into squares dipping it in melted Hershey bars with a slice of banana. ooh those sara lee ones are yum too! The one thing about pound cake is i find that its just…plain…you have to spice it up w/ something. This is just a super basic one, but there are a million recipes out there for people who like more spice in their cake. Im sure you could come out w/ something majorly creative. I used to love the Sara Lee and other refrigerated/frozen cakes, but now after eating a few slices, I start thinking about all of the “stuff” (non-butter, non-sugar, non-real, etc. things) in the ingredients and get grossed out. It is kind of like when I eat too many McDonald’s French fries. 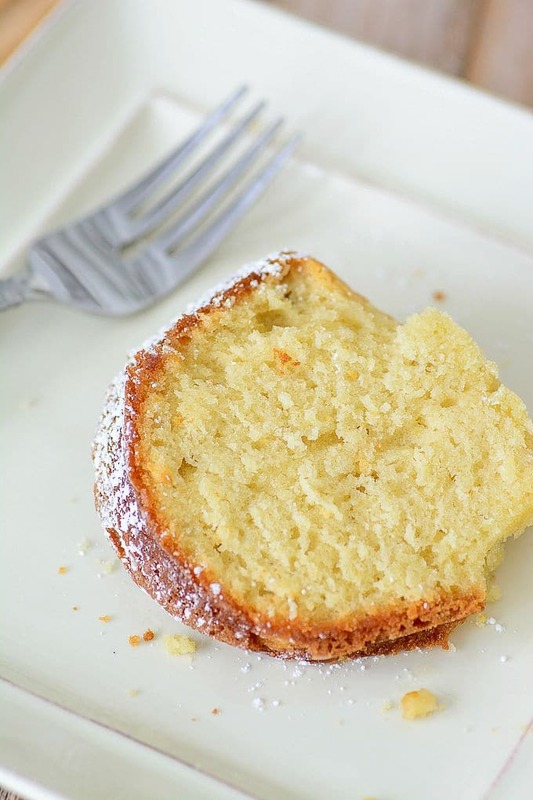 I make a lemon-butter pound cake http://milkandhoneymommy.com/recipebox/2010/05/lemon-butter-pound-cake/. I topped it w/strawberries and whipped cream, but believe me, this recipe taste good all by itself, especially when cut into small pieces so I can hide in my room and eat it w/o my kids finding me. yum. all you need now are strawberries.